If you like to dress in layers, you might also be fond of eating in layers…and if that’s the case, today will be right up your alley. November 25 is National Parfait Day! It’s also National Eat With a Friend Day. But without a specified food to share, we’re going to have to stick with parfait, even though we have already honored this sweet dessert twice – with chocolate parfait in May and strawberry parfait in June. Both times previously we made our parfait from scratch, but since then discovered that one of our favorite local grocery markets (and sources for our challenge) carries fresh parfaits in their bakery section. Never ones to look a gift horse (or in this case, a gift parfait) in the mouth, I was keen on simply picking one up and celebrating that way. Thanks, WinCO, for making the third go-round on this particular challenge nice and easy! 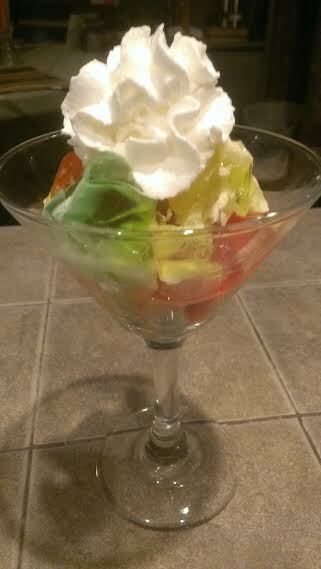 We had a rainbow parfait made with Jell-O and whipped cream. It was very slurpable. And a nice change of pace, having Jell-O instead of pudding.